After testing the three beta versions of iOS 6.1 Beta Firmware on iPhone, iPad and iPod now Apple has officially releases the latest iOS 6.1 Beta 4 IPSW Firmware for iPhone 5, iPhone 4S, iPhone 3GS, iPad 4, iPad 3, iPad 2, iPad Mini, iPod 5G Touch and iPod 4G Touch devices for iOS Developers and General Users worldwide. 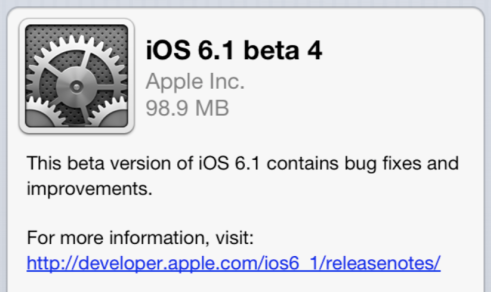 Users can download and install the latest iOS 6.1 Beta 4 (Build 10B5126b) update directly from Apple iDevices through OTA (Over-the-Air) Wirelessly by simply going to Settings > General > Software Update on a respective Apple iDevice. Apple iOS 6.1 Beta 4 IPSW Firmware is also available for download on iOS Dev Center Website and you can also Download and Install iOS 6.1 Beta 4 IPSW Firmware via Direct Download Links available for iPhone 5, iPhone 4S, iPhone 3GS, iPad 4, iPad 3, iPad 2, iPad Mini, iPod 5G Touch and iPod 4G Touch devices below. Update: Download and Install Latest Apple's iOS 6.1 Final IPSW Firmwares for iPhone, iPad & iPod Touch Now. If any user is running an old beta version of iOS 6.1 Beta 1, 2 and 3 on iPhone, iPad and iPod Touch than you can directly download and install iOS 6.1 Beta 4 (Build 10B5126b) from their devices via OTA (Over-the-Air). The over-the-air update file size is roughly 98.9 MB in size or Users of iPhone 5, iPhone 4S, iPhone 3GS, iPad 4, iPad 3, iPad 2, iPad Mini, iPod 5G Touch and iPod 4G Touch can also download and install iOS 6.1 Beta 4 update via iTunes from our following official mirrors (Direct Download Links). The good news is that Unlock and Jailbreak for iOS 6.1 Beta 4 Firmware On Pre-A5 iPhone 4, iPhone 3GS and iPod 4G Touch devices is possible via RedSn0w v.0.9.15b3 Tool so users dont need to worry about Jailbreaking of iOS 6.1 Beta 4 Firmware on iPhone, iPad and iPod Touch. Update: Download and Install Latest Apple's iOS 6.1 Final IPSW Firmwares for iPhone, iPad & iPod Touch Now. Apple users can download iOS 6.1 Beta 4 setups files from the following official mirrors. How to Unlock, Jailbreak and Activate iOS 6.1 Beta 4 Firmware on iPhone, iPad and iPod Touch?